The maximum size of sent emails can be specified here. If this field is left blank, the email size will not be taken into account. Select your required unit using the drop-down list. By default, 10 MB is predefined as the maximum size. This corresponds with the expected computer network norm for the maximum message size (e.g. preset value by Postfix or Microsoft Exchange Server). In general, it should only be modified when you're certain that the potential recipients can receive messages of this size. Here, the maximum number of emails per SMTP session can be constrained. If there are several mails to be sent at the same time the smtp session will be terminated after reaching this limit. 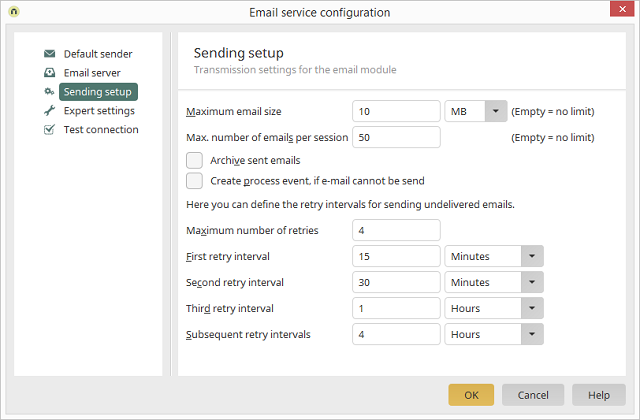 In the next transit a new smtp session will be created for the sending of the emails. The waiting time between the two transits of the sending loop is defined by the "de.uplanet.lucy.sendmail.sleepInterval" setting (default : 1000 ms ). If this setting is active, then sent emails will be stored in an archive file. You can change the corresponding path in the Expert settings. In the lower part of the dialog you can define the time intervals, after which unsuccessful email delivery attempts will be retried. Here, you can specify the number of times that an undeliverable mail should be re-sent. Below you can set the intervals between the first, second, third and subsequent retries. Each interval will be calculated from the last time the sending was attempted. We recommend keeping the default settings for the resending of emails.